This week’s post is written by Ellyson Glance ’16, a student assistant at Davidson College’s E.H. Little Library. For the bulk of my summer at the library, I found myself in a place to which I had barely ventured, save for the library tour during orientation and the rare instance where a library patron would ask me for directions while I was at the information desk: the Davidson College Archives & Special Collections. During my time in the archives, I was responsible for various projects and tasks assigned to me by our brilliant and lively archives staff – consisting of Jan Blodgett, Sharon Byrd, and Caitlin Christian-Lamb. Every day I became more and more familiar with the storage, care, and organization of our archives, and never could I have imagined how immense their scope would be. Not only did I get the chance to handle artifacts from both the town and the college, but I also got the chance to actually do some research for the archivists through perusing the archival storage areas. Here in the archives, I could interact with the history of the college I love as well as pass on that information to others via my projects. One of my earliest, and possibly favorite, projects was the transcription of a lengthy interview with Dr. Charles Dockery, a former French professor at Davidson and the first African-American professor to teach at the college. I was transfixed by his stories and accounts of his time at Davidson as well as his childhood and upbringing, which shaped him into the kind, intellectually curious, and well-spoken man that I heard through my headphones. Aside from being interested solely in the unique and thoughtful subject of the interview, however, I found myself taking a shine to the act of transcribing itself. It appealed to the perfectionist in me, and I embraced the challenge of typing out every single word or utterance within the recording. The bulk of my work in archives, however, was in the form of digitization, digitization, digitization! This task, in essence, is scanning, organizing, and cataloging an archival item so that it can be easily accessed on the internet. In my case, I was digitizing the entire archival collection of Scripts ‘N Pranks – a student run joke magazine, spawning from the Davidsonian’s Yowl, and spanning from 1936 to 1965. The editorial staff of the magazine put out approximately four issues a year – though some years, such as the war years, there were fewer – with each issue operating loosely off of a theme demonstrated on the cover. Cover of the May 1937 centennial issue. 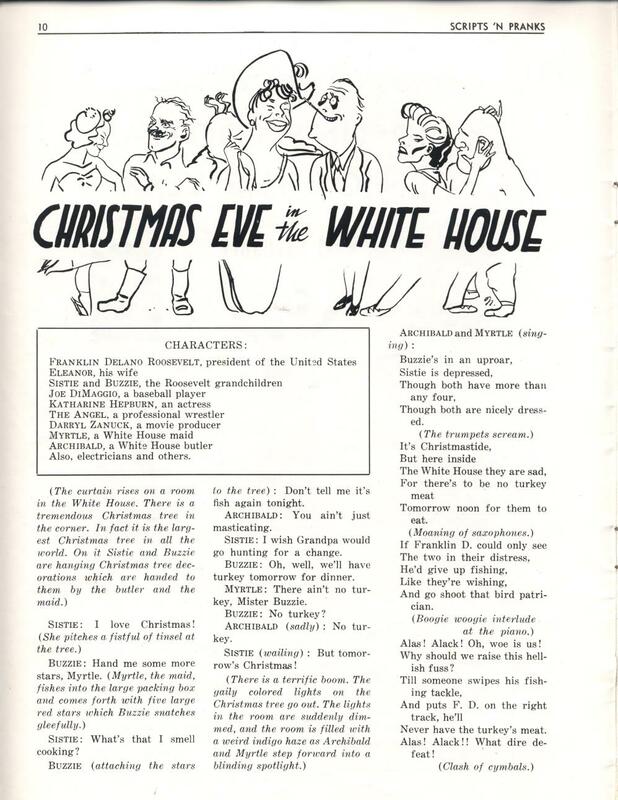 The magazine itself consisted of humorous poems, short-stories, mini-plays, and cartoons, with the cover of each issue being hand drawn by the Art Director for that year. And, during its run, Scripts ‘N Pranks contained entries from the likes of novelist Vereen Bell and Sam Ryburn, an early editor for whom the Ryburn senior apartment building is named. 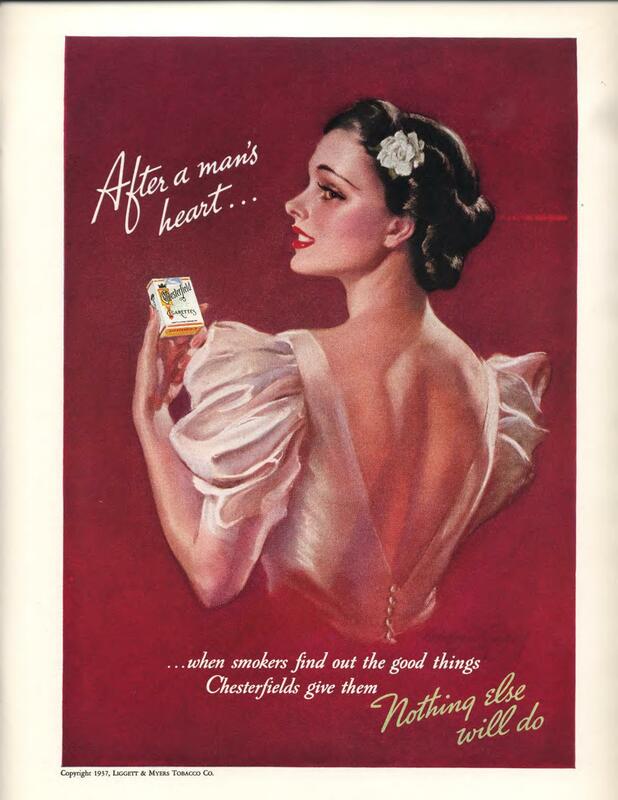 But, some of my favorite drawings to look at in the magazine, particularly in earlier years, were the beautiful and richly colored advertisements that the editors would include – though that was, of course, after I got over the initial shock of having a student-run publication appear to be solely funded by cigarette companies. 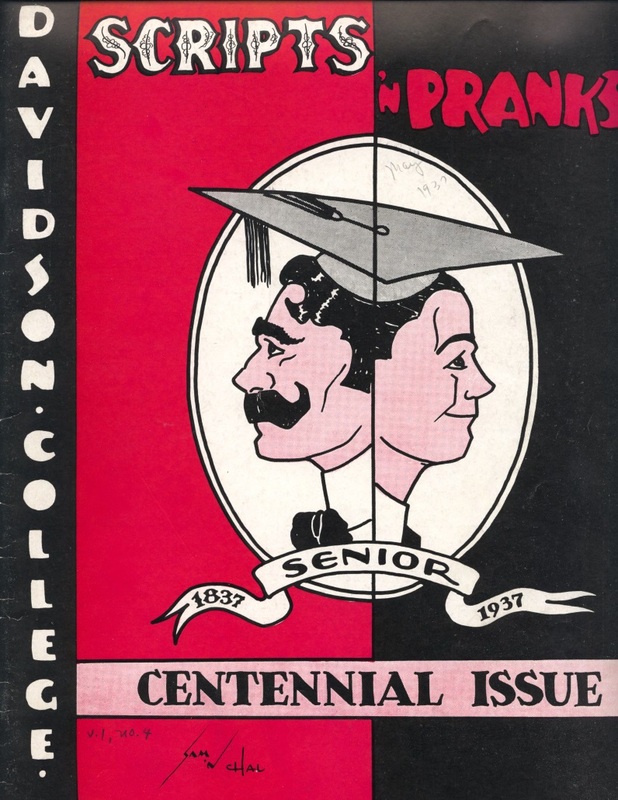 The majority of these magazines have now been uploaded onto the Davidson College Digital Repository, so that you can peruse, read, and enjoy these marvelous and historical relics yourself.